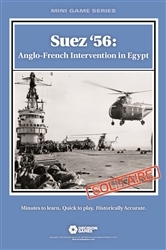 Suez �56 places you in command of British, French, and Israeli forces in Operation Musketeer, the invasion of Egypt. The historical objective was to regain control of the Suez Canal and potentially remove Egypt�s President Nasser. Your mission is to achieve those objectives while avoiding the political debacle that marred the actual event.